If you have thought about your end-of-life care choices and talked with your loved ones, documenting your decisions is the next step in the process. By documenting your decisions, you are giving your loved ones a wonderful gift: peace of mind. This step in the process helps your healthcare providers and your loved ones know how you would like to be cared for in the future. The Medical Power of Attorney form documents your choice for someone to carry out your health care decisions for you if you are no longer able to make decisions for yourself. 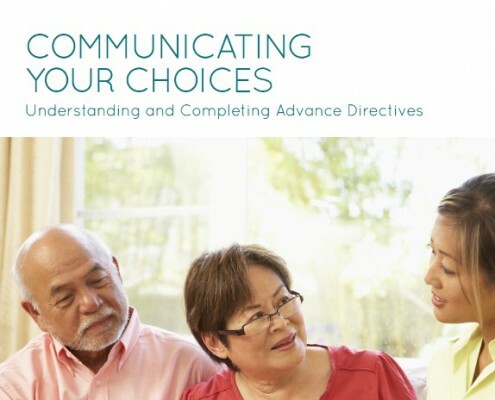 The Directive to Physicians and Family or Surrogates form contains instructions about treatments you may or may not want if you have an irreversible or terminal condition, or you are no longer able to communicate. To help you, click here to download and print the “Communicating Your Choices” booklet. This booklet includes both forms along with step-by-step instructions. Once you complete this booklet, be sure to make copies and give them to your healthcare providers and loved ones.